- Drag myself outta bed when the alarm goes off the third time, while turning it off and cursing it at the same time. - Stumble to the shower and take a half-awake shower while wishing I could just go back to bed. - Stumble outta the shower and to the coffee pot for the first cup of coffee. Must. Have. Coffee. - Then, I always put an ice cube in my coffee (cuz I don't like hot drinks that burn my mouth - it's a thing with me). - Then, I carry said coffee into the bedroom and proceed to get ready for work. When drowsily reaching for the freezer handle, something on my refrigerator MOVED. O.K., now let me be clear that NOTHING on OR in my fridge is supposed to MOVE. So, this was enough to simultaneously cause me to gasp, jump back, and suddenly become WIDE awake. Then, I saw what it was that had moved, and this caused me to simultaneously go "awwwww", begin talking to said critter, and cause Molly-Collie to stare at her mommy wondering if she needed to go wake Daddy up, because Mommy may have lost her mind. just under the water & ice cube dispenser. No, I have no idea how it got in my house. That's exactly what Hubs asked me when I told him. 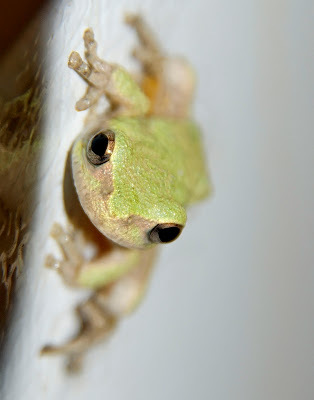 Heck, it was such a tiny tree frog that it could have come in on Molly when she went potty for the night. Or, it could have even come in on Hub's boots when he came in from mowing hay until after dark. After photographing it, I went to pick it up, and it jumped off the fridge. This initiated about five to ten minutes of the "Misty chases froggy/Froggy hops away just as Misty tries to grab it/Misty chases froggy again/repeat/repeat" game. I finally caught it and took it outside. Seems I've been performing a lot of critter rescue missions lately. Wow, awesome story. what a cute little critter. Glad it was ok and taken back outside. So cute. I'm sure that woke you up. Wow, you're brave. If something moved on my fridge, I'd scream, I wouldn't say, "Awwwww." Good thing it was you chasing Froggy and not Doggy-chase-Froggy. Interesting way to wake up. If that had happened to me, I'd be awake for a week. Cute story and froggy, Misty! Have a happy 4th of July! Ice cube in a hot drink--totally with you on that one! What a great capture, especially since you weren't even preparing for it! Living So Abundantly: New meme this coming Thursday, July 7, 2011, Give Back Thursday--come join the fun! OMGosh, I just fell over laughing at that morning of yours. I'm not sure I would have handled it quite so well that early. How very cool! I'm so glad there was a happy ending. Cute little guy. I fear I would have smashed the poor little thing before I realized it was a harmless critter...as I did with a poor gecko once. Cool story to go with such a cute shot! And to think you didn't even have to go outside to capture a "wildlife" shot!